Ira Emmett Hinshaw1,6,7 [Ira Emmett Henshaw5, Emmett Hinshaw5,8]. Hinshaw, Emmet, head-of-household, age 23, born in Alabama; father born in Alabama; mother born in Tennessee; rented home; occupation: farmer, general farm. Hinshaw, Clara or Flora [unclear], wife, age 18, born in Alabama; parents born in Alabama. 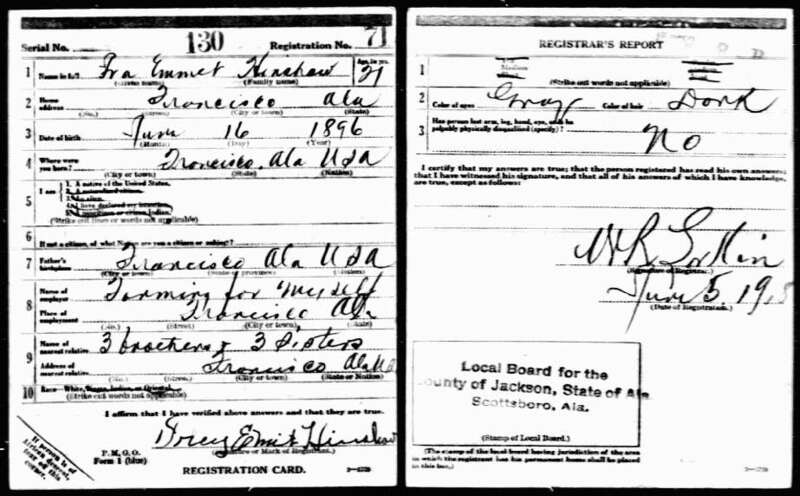 Hinshaw, Emit, head-of-household, age 32, born in Alabama; parents born in Alabama; first married at age 21; rented home; no radio in home; occupation: farmer, general farming; World War I veteran. Hinshaw, Nannie, wife, age 28, born in Alabama; parents born in Alabama; first married at age 17. Hinshaw, Elsy [unclear], daughter, age 8, born in Alabama; parents born in Alabama; attended school. Hinshaw, Mary J., daughter, age 6, born in Alabama; parents born in Alabama. Hinshaw, John L., son, age 2, born in Alabama; parents born in Alabama. Hinshaw, Emit, head-of-household, age 43, born in Alabama; on Apr 1 1935 was residing in the same place; completed 8th grade; owned home ($300 value); occupation: farmer, farm. Hinshaw, Nannie, wife, age 39, born in Alabama; on Apr 1 1935 was residing in the same place; completed 8th grade. Hinshaw, Epsie, daughter, age 18, born in Alabama; on Apr 1 1935 was residing in the same place; completed 1 year of high school. Hinshaw, Mary, daughter, age 16, born in Alabama; on Apr 1 1935 was residing in the same place; completed 7th grade. Hinshaw, Lawson, son, age 12, born in Alabama; on Apr 1 1935 was residing in the same place; completed 6th grade; attended school. Hinshaw, Lester, son, age 9, born in Alabama; on Apr 1 1935 was residing in the same place; completed 4th grade; attended school. Hinshaw, Opal, daughter, age 7, born in Alabama; on Apr 1 1935 was residing in the same place; completed 1st grade; attended school. Hinshaw, Bertie Lou, daughter, age 3, born in Alabama; attended school. Hinshaw, Ray, son, age 9 months, born in Alabama. Hinshaw, Fay, daughter, age 9 months, born in Alabama. 1930 census, Colliers Precinct, Madison County, Alabama; roll T626-37, ED 14, page 6B, line #76, dwelling #105, family #105. 1940 census, Owens Crossroads, Madison County, Alabama; roll T627-57, ED 45-44, page 14B-15A, line #80. Contribution from Shannon Dale Byrd. 1900 census, Harmony Precinct, Jackson County, Alabama; ED 43, page 289B-290A, line #99, dwelling #58, family #58. 1910 census, Harmony Precinct, Jackson County, Alabama; ED 37, page 59B, line #89, dwelling #192, family #192. 1920 census, Bishop, Jackson County, Alabama; roll T625-19, ED 40, page 10A, line #45, dwelling #70, family #71. 1920 census, Bishop, Jackson County, Alabama; roll T625-19, ED 40, page 10A, line #47, dwelling #71, family #72. Photos courtesy of Shannon Dale Byrd ().